Gustilo is the most commonly used system to classify open fractures. This was created by Ramon Gustilo and Anderson and then expanded by Gustilo Mendoz and Williams later on. Gustilo system of classification uses the amount of energy, soft tissue damage and the extent of contamination to determine the type and severity of the fracture. II – Open fracture with wound > 1 cm inlength without extensive soft-tissue damage and no flaps or avulsions. 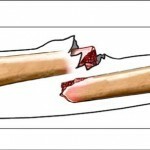 III – Open segmental fracture or a fracture with extensive soft tissue laceration, damage or loss. Gustilo type 3 fractures include open fractures caused by firearm injuries, fractures requiring vascular repair or fractures which have been open for 8 hour prior to the treatment. III A – Type III fracture with adequate periosteal coverage of the fractured bone despite extensive soft tissue damage or laceration. III B – Type III fracture with extensive soft tissue damage / loss and periosteal stripping with bone damage. This type of gustilo fracture is usually associated with massive contamination. Gustilo Type III fractures usually require further soft tissue coverage procedure like free or rotational flap. III C – Gustilo type III fracture with arterial injury, requiring repair. This is irrespective of degree of soft tissue damage.